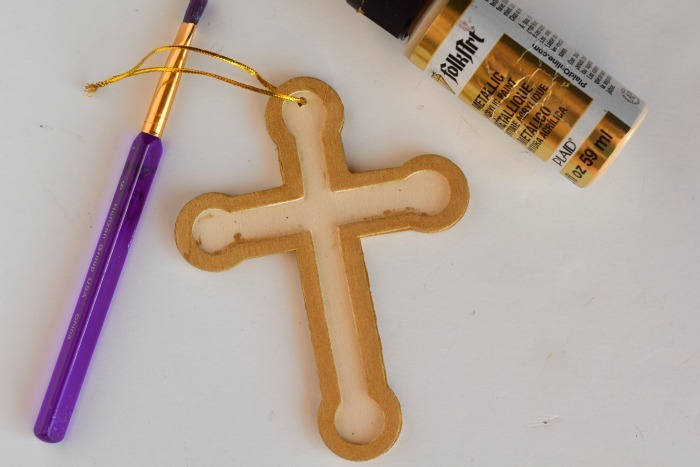 I’m excited to be including this Foam Bead Cross Ornament craft with you today as part of my Faith Inspired Ornament series. 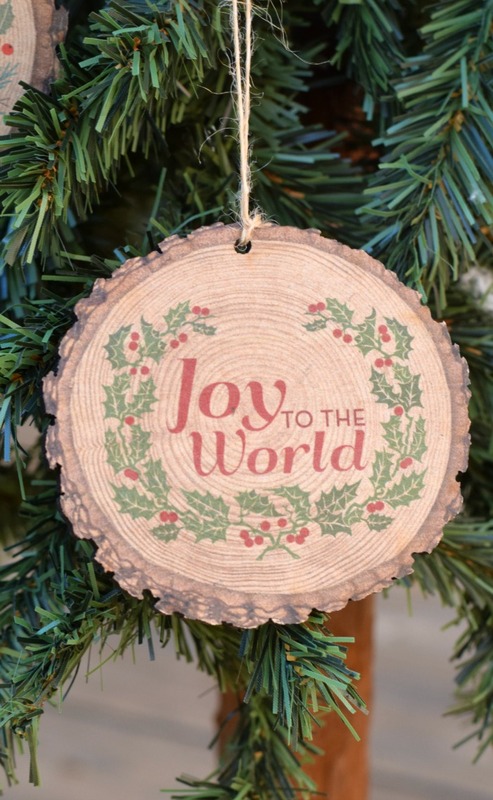 Thank you to Family Christian Stores for sponsoring this post with other ornament ideas for the non-DIY types! 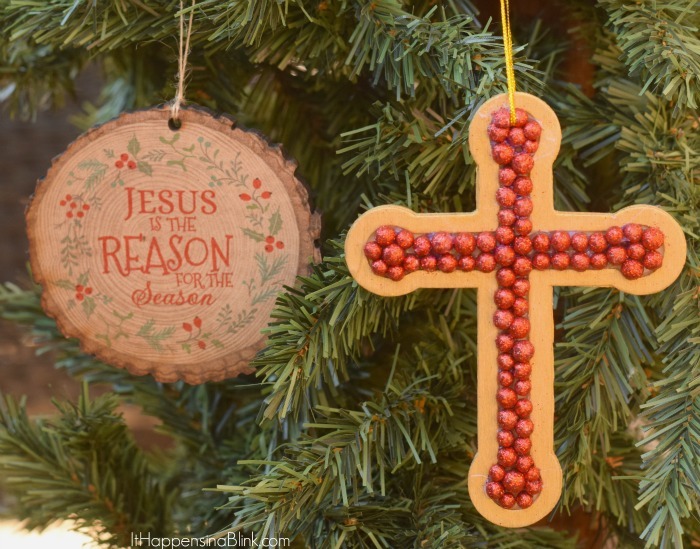 I’m sharing another ornament craft today in my quest to create a Christ centered Christmas tree. My goal, by the end of the Advent season, is to have enough ornaments to decorate a tree that is 100% faith based. My desire is to have a tree that reflects who I feel is the reason for the season. Whether I’m making my own ornaments, or purchasing them from Family Christian stores, I believe that this is an achievable goal. If you’ve missed the past week’s, be sure to check out the Cross Fingerprint Ornament, Glitter Cross Ornament, and Light of the World Bulb Ornament. A few weeks ago, I was walking through the craft store, and I spotted these glitter foam craft balls near the Christmas ornaments. They were in several different colors, and they were reasonably priced, so I picked up a bag. Little did I know that they would become my newest favorite craft item. They are fun, easy to use, and add a little bling to any project! 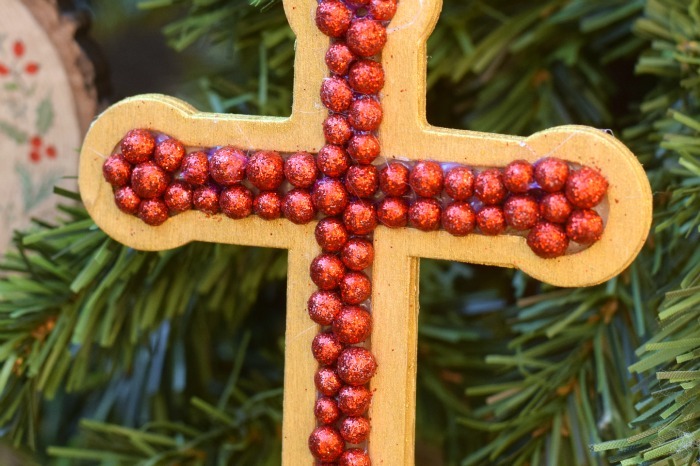 I’m using them today for this Foam Bead Cross Ornament craft. 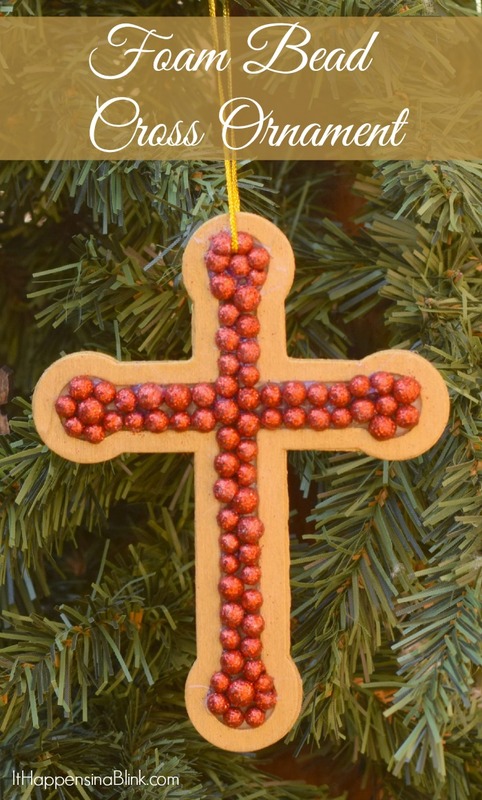 If you’re looking for a store that carries the foam beads and the Wood Cross Ornament, I purchased mine from Hobby Lobby. I’ve also seen similar ornaments at AC Moore. Begin by painting the raised edge of the ornament and letting it dry completely. Once the front has dried, go ahead and paint the back, too. 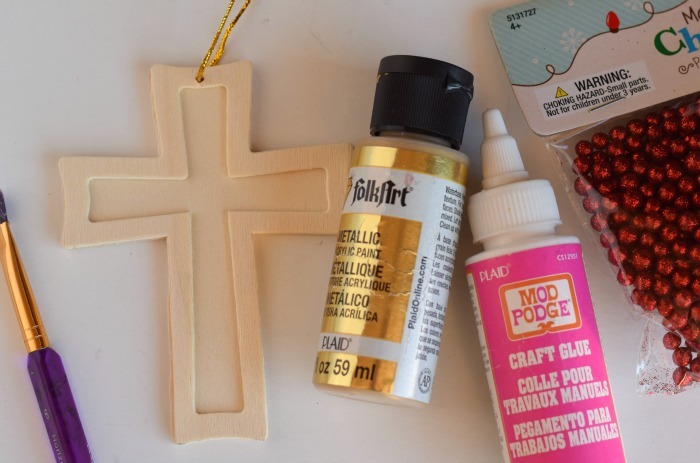 Apply a generous amount of craft glue to the inside of the ornament. Press the foam beads to the glue, covering the inside of the ornament completely. This method is great if kids are involved in making the ornament. Use hot glue and a hot glue gun to secure the foam beads to the inside of the ornament. If you are having issues covering the inside of the ornament, you can use a hot glue gun to melt the sides of the foam beads so that they all fit together better. Let the glue (whatever kind that you used) dry completely. Now hang it on the tree and watch it twinkle! Ok, I know what some of you are thinking. So would you make an ornament, purchase one, or both?? 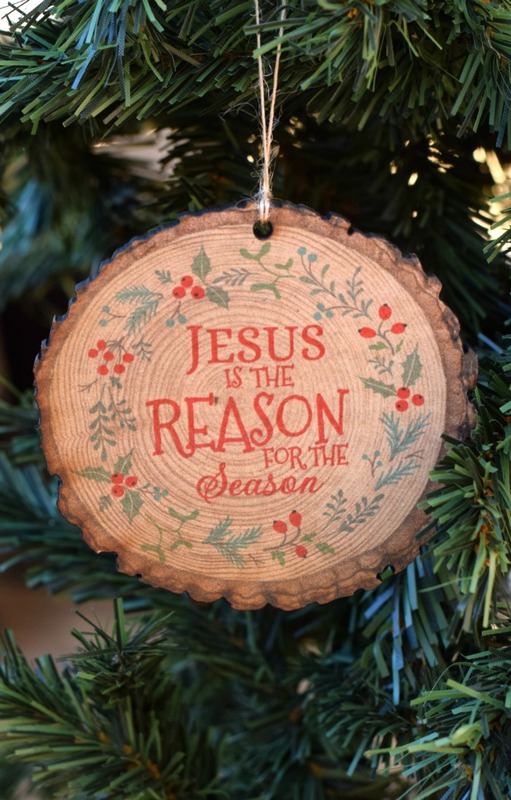 Either way, incorporating faith based ornaments into your Christmas decorating is an excellent way to remember the reason for the season! Hello! These are lovely ideas. Thank you. I was wondering if you knew where I might find foam ornaments shaped like a lamb or sheep…I want to make some ornaments by gluing pearls, literally covering, the form. The ones I saw on a Chrismon tree in a Church were about 4 inches long and 2 1/2 inches high. Thank you for helping me. I have not seen anything like you are referring to in stores or online. I wonder if you could make something that would work with different sized styrofoam balls? Sorry that I could not be of more assistance!